Car Trek – The Karaoke Cab helps online Go Fund Me launch of Dorran Godfrey's crowd funding efforts towards his music goals of studying at Interlochen and Julliard. Other local families also struggling with college education funding costing more per year than annual United States income. Car Trek – The Karaoke Cab, a regular advocate for the arts, is helping to launch the Go Fund Me online crowd funding campaign for Dorran Godfrey, aged 13 of Traverse City. Godfrey is pursuing a career in music with the goal of studying at Interlochen and Julliard. However, the education funding required per year is more than $49,000. Car Trek showed its support by funding Godfrey to produce a video and crowd funding page at Go Fund Me, showcasing his musical goals and his unique spirit and drive. Car Trek is also working locally and online to help secure education funding for Godfrey’s music goals. Financial support is, of course, always welcome. However, the community can help Godfrey in other simple ways by sharing his video and crowd funding page at http://gofundme.com/entertainer, helping with musical instruments or being willing to act as a mentor. Realizing how expensive tuition can be for music art schools like Interlochen and Julliard, Godfrey’s video and crowd funding page creatively explains his step by step plans to achieve the much needed music education funding. With regard to his desire to study at Interlochen and Julliard, Godfrey reasons that it is doubtful whether such music education costs can be covered, without help from the crowd funding community. This is why Car Trek is strongly supporting his music education funding efforts. Although Godfrey’s approach is unique, his college education funding problems are not. According to Forbes, the education funding requirements this year to study at a public college in the United States averages $28,387 (including fees, books and housing). In disciplines such as engineering or the arts, certain courses are only taught at private schools, requiring about $59,341 in higher education funding. On the other hand, the Department of Numbers reveals that the average household has a median income of $53,657 and the income per person is just $28,889. A year of funding a college education now thus requires more than the median annual income in the United States. Although financial aid and scholarships have helped, two other Car Trek customers note that, like Godfrey, crowd funding was an important strategy for them too. Many nations appear to agree. Several countries offer free or minimal cost college education funding for United States students, such as Norway, Slovenia, Finland, Sweden, France and Brazil. Germany, too, is actively seeking foreign students to meet its shortage in the workforce. A fact that Maria Ellis, aged 19 from Kalkaska, MI is happy to exploit while studying International Business Management at Hochschule Furtwangen. Crowd funding through the local community again proved helpful in raising her travel costs. Regardless of other efforts to solve college education funding, it seems likely that, in the future, crowd funding strategies like Godfrey’s will become increasingly necessary. 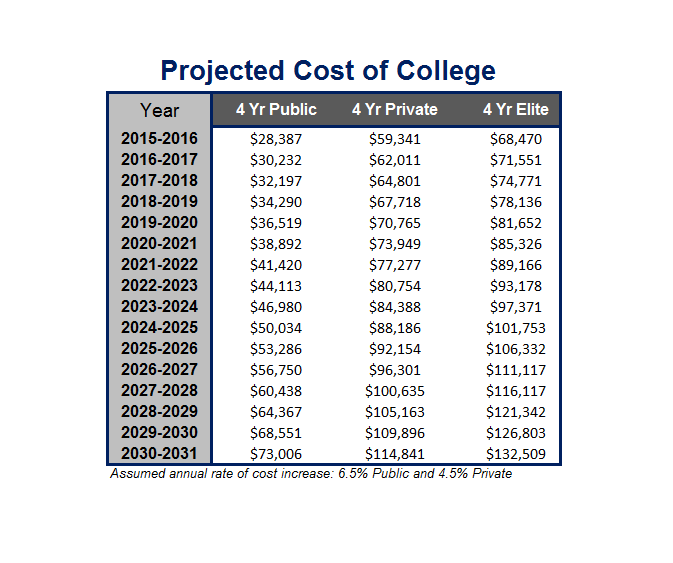 Forbes - Projected Cost of College Education FundingChart of projected annual college education funding costs within the US at public, private and elite schools.